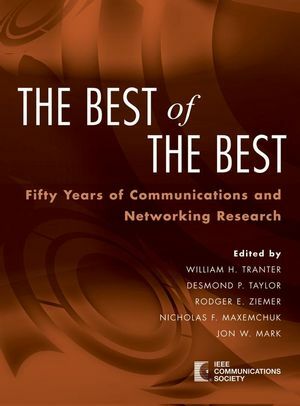 The Best of the Best: Fifty Years of Communications and Networking Research consists of a group of 50 papers selected as the best published by ComSoc in its various journals in the Society’s 50-year history. The editors of the collection have written an essay to introduce the papers and discuss the historical significance of the collection and how they were selected for the collection. The book divides the papers into two major categories (Communications and Networking) and groups them by decade within these major subdivisions. PHYSICAL AND LINL LAYER ASPECTS OF COMMUNICATIONS. Turbo Space-Time Processing to Improve Wireless Channel Capacity. A Simple Transmit Diversity Technique for Wireless Communications. A Space-Time Coding Modem for High-Data Rate Wireless Communications. Erlang Capacity of a Power Controlled CDMA System. Decorrelating Decision-Feedback Multiuser Detector for Synchronous Code-Division Multiple-Access Channel. Dense Wavelength Division Multiplexing Networks: Principles and Applications. Near-Far Resistance of Multiuser Detectors in Asynchronous Channels. Multiple-Symbol Differential Detection of MPSK. The Effects of Time Delay Spread on Portable Radio Communication Channels with Digital Modulation. A Statistical Model for Indoor Multipath Propagation. Standardized Fiber Optic Transmission Systems. A Synchronous Optical Network View. Analysis and Simulation of a Digital Mobile Channel Using Orthogonal Frequency Division Multiplexing. Efficient Modulation for Hand-Limited Channels. Optimum Combining in Digital Mobile Radio with Cochannel Interference. MMSE Equalization of Interference of Fading Diversity Channels. The SL Undersea Lightguide System. Distribution of the Phase Angle Between Two Vectors Perturbed by Gaussian Noise. Cochannel Interference Considerations in Frequency Reuse Small-Coverage-Area Radio Systems. GMSK Modulation for Digital Mobile Radio Telephony. Continuous Phase Modulation-Part 1: Full Response Signaling. Continuous Phase Modulation-Part II: Partial Response Signaling. Carrier and Bil Synchronization in Data Communication. A Tutorial Review. Tamed Frequency Modulation. A Novel Method to Achieve Spectrum Economy in Digital Transmission. Performance Evaluation for Phase-Coded Spread-Spectrum Multiple-Access Communication Part I: System Analysis. The Throughput of Packet Broadcasting Channels. Maximum Likelihood Receiver for Multiple Channel Transmission Systems. An Optimum Linear Receiver for Multiple Channel Transmission Systems. Adaptive Maximum-Likelihood Receiver for Carrier-Modulated Data-Transmission Systems. Error Probability in the Presence of Intersymbol Interference and Additive Noise for Multilevel Digital Signals. Coherence Demodulation of Frequency-Shift Keying with Low Deviation Ratio. Data Transmission by Frequency-Division Multiplexing Using the Discrete Fourier Transform. Viterbi Decoding for Satellite and Space Communication. Convolutional Codes and Their Performance in Communication Systems. An Adaptive Decision Feedback Equalizer. Performance of Optimum and Suboptimum Synchronizers. Characterization of Randomly Time-Variant Linear Channels. On the Optimum Detection of Digital Signals in the Presence of White Gaussian Noise. A Geometric Interpretation and a Study of Three Basic Data Transmission Systems. Performance of Combined Amplitude and Phase-Modulated Communication Systems. On the Self-Similar Nature of Ethernet Traffic (Extended Version). A Generalized Processor Sharing Approach to Flow Control in Integrated Services Networks: The Single-Node Case. DQDB Networks with and without Bandwidth Balancing. Input Versus Output Queueing on a Space-Division Packet Switch. Routing in the Manhattan Street Network. Routing and Flow Control in TYMNET. OSI Reference Model. The ISO Model of Architecture for Open Systems Interconnection. Deadlock Avoidance in Store-and-Forward Networks. Store-and-Forward Deadlock. A Minimum Delay Routing Algorithm Using Distributed Computation. Packet Switching in Radio Channels: Part 1-Carrier Sense Multiple-Access Modes and Their Throughput-Delay Characteristics. Packet Switching in a Multiaccess Broadcast Channel: Performance Evaluation. A Protocol for Packet Network Intercommunication. Routing Procedures in Communications Networks. Part 1: Random Procedures. Founded in 1952, the IEEE Communications Society (ComSoc) is a community comprised of a diverse group of industry professionals with a common interest in advancing all communications technologies. To that end, the Society sponsors publications, conferences, educational programs, local activities, and technical committees that: Foster original work in all aspects of communications science, engineering, and technology; Encourage the development of applications that use signals to transfer voice, data, image, and/or video information between locations; Promote the theory and use of systems involving all types of terminals, computers, and information processors; all pertinent systems and operations that facilitate transfer; all transmission media; switched and unswitched networks; and network layouts, protocols, architectures, and implementations; And strongly advance developments toward meeting new market demands in systems, products, and technologies such as personal communications services, multimedia communications systems, enterprise networks, and optical communications systems.